Have you ever heard the term, thrown for a loop? If you have, be prepared to be thrown for several loops if you read this book. “Death of the Family” rolls on as The Joker ups his game to sinister proportions. 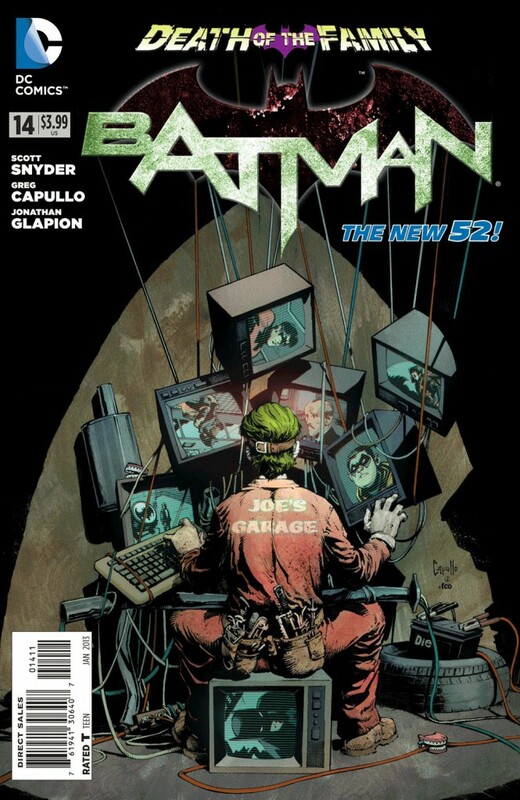 There is a lot of dialogue which was the right choice considering the message Scott Snyder is trying to send that this is the most violent incarnation of the Clown Prince of Crime we have seen in years. Fear is what drives this story in every direction. Batman doesn’t want Gordon or the Bat-Family dealing with The Joker but he soon finds out that not even he can shield them from his wrath. Gordon gets poisoned and Capullo captures this in a beautiful splash page where the commissioner is bleeding out. Everything leads to the bridge where Batman and Joker has their first battle where the evil clown reveals he knows the identities of the Batman, Nightwing, Robin, everyone. It’s a cliffhanger for sure because you don’t know for sure if he is for real or just playing mind games with The Dark Knight.